Knowing how to get butter stains out of clothing comes in handy, especially if you have children or if you cook frequently. Use these laundry tips to make that butter vanish. Butter stains can be a challenge to remove from clothing due in large part to their greasy, oily texture. Most standard detergents are not made to battle greasy food stains, which is why butter can be tricky to remove from materials such as cotton, denim, linen and polyester. What's more, butter stains can be inconsistent. Sometimes if you catch the stain quickly it may lift off easily, but other times it takes multiple tries to remove. It doesn't help that butter stains are difficult to notice. Biting into a cob of corn slathered in melted butter can lead to soiled shirt in no time. However, a few drops of butter on a shirt or pants can easily go unnoticed for hours if you are distracted with good conversation and even better food. In some cases you may not even realize you have a butter stain until you glance down at dried grease marks on your pants. Fortunately, leaning how to get butter stains out of clothing is not too hard. As long as you have the right cleaning materials on hand and are not afraid to experiment with a variety of techniques, you won't have a problem figuring out how to get butter stains out of clothing. 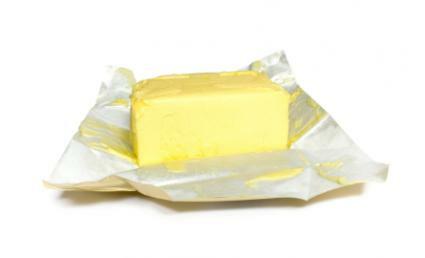 Blot off excess melted butter or scrape off excess dried butter with dull knife or spoon. Pretreat clothing with a stain remover, such as Shout Liquid Laundry Stain Remover. Blot the stained area and launder as usual. If the stain remains after the initial wash, place the soiled clothing stain side down on an absorbent pad. Add liquid laundry detergent through the back of the stain and blot with a clean absorbent pad. Let sit for a few minutes. If you use powder laundry detergent, then create a paste from the dry laundry soap and some water and apply it directly to the butter stain. Let it sit for half an hour before placing it in the washing machine and laundering as usual. A good grease solvent, such as Dawn liquid dish soap is effective on butter stains. The components in the liquid dishwashing soap act as an emulsifier to break down the water and grease bonds, so that the water can wash away the grease. Simply apply a few drops of the soap directly to the stain and work it in with your fingertips. Let it sit for about two hours, and then launder as usual. Believe it or not, WD-40, the product that protects metal from rust and corrosion, penetrates stuck parts, displaces moisture, and lubricates squeaky wheels, can also help rid butter stains from clothing. The cleanser is an emulsifier, which helps lift oil from fabric. It works best on dried butter stains that have gone unnoticed for a while. WD-40 helps to loosen the stain, so you can treat it and remove it from your clothing. Simply spray some WD-40 on the stained clothing and let sit for a few minutes until it can start emulsifying the residual butter. Then, launder the clothing as usual. In addition to the aforementioned cleaning methods there are other ways to get butter stains out of clothing. For example, adding a few drops of ammonia to the stain before placing it in the washing machine. Others swear by the shampoo method. Simply apply a few drops of clear or white shampoo to the butter stain and rub it in thoroughly before placing it in the washing machine. Another technique you could try is to spray some inexpensive hairspray onto the butter stain before putting the article of clothing into the wash.
A more controversial method requires pouring a bit of lighter fluid onto the butter stain, and then rub or brush the fabric in order for the lighter fluid to be absorbed by the butter. The lighter fluid has properties that help absorb oil. However, this technique can be extremely dangerous if you are not working in a well-ventilated area or you are applying the lighter fluid near a heat source. When trying to remove butter stains from clothing you should always use the hottest water the item can stand. Also, it's important to examine the stained item as soon as you remove it from the washing machine. Some butter stains are hard to see when the clothing item is wet, which is why you should allow the item to air dry. Never place a wet stained item into the dryer, as the stain will be almost impossible to remove once it is baked onto the clothing.